MOSCOW, January 11. /TASS/. The analysis of terrorists’ drones captured in Syria has shown that they cannot be made in an improvised manner, head of the Russian General Staff's department for the development of unmanned aerial vehicles Maj. Gen. Alexander Novikov said. "The creation of drones of this class is impossible in an improvised manner. Their development and usage involved specialists, who had undergone special training in the countries manufacturing and using systems with unmanned aerial vehicles," the general said. The assembly and usage of unmanned aerial vehicles is a difficult engineering task that demands "special training, know-how in various scientific areas and practical experience in creating these devices," he said. Special software is also needed to use these drones, the general noted. For efficient usage of ammunition information on exact target location and such parameters as altitude, flight and wind speed is required. This information cannot be obtained from the Internet, Novikov stressed. Moreover, the explosives from the bombs carried by drones that attacked Hmeymim and Tartus bases in Syria cannot be made in makeshift conditions. There are several places where this substance is manufactured and one of them is Ukraine, according to Novikov. "Preliminary analysis has shown that the main explosive used in the bombs was pentaerythritol tetranitrate (also known as PENT, PENTA or TEN), which has a far higher yield than hexogen. This explosive is manufactured in a number of countries, including Ukraine’s Shostka chemical agents plant. It cannot be made in makeshift conditions or extracted from other ammunition," he said. Novikov said special tests were being made with the aim to find out the country of origin. Drones used by terrorists carried explosives stuffed with ball bearings, according to Novikov. "Drones’ weapons deserve attention. These are improvised explosive devices weighing about 400 grams, and stuffed with striking elements - ball bearings with a striking radius of up to 50 meters," the general said. Russia’s military has deciphered route data from the drones that attacked Russian bases in Hmeymim and Tartus in Syria, confirming that they had been launched from one place. "The slide shows deciphered data from the captured drones on their programmed and real flight routes and points of dropping munitions. One drones was equipped with a video camera and designed for controlling and adjusting the strikes if needed," the general said. Militants in Syria earlier used drones only for air reconnaissance, but isolated incidents were seen when they were used for attacks, Novikov stated. "Up until recently, gunmen used drones mainly for air reconnaissance. Only isolated incidents were fixed when they were used for attacks," he said. According to the major general, those were mainly improvised drones, made of components sold on the open market. The militants started using foreign-made quadrotor helicopters to conduct air reconnaissance and carry out strikes in mid-2016. "In mid-2016, foreign-made quadcopters were launched to conduct air reconnaissance and carry out strikes. It should be noted here that we registered the appearance of new types and versions of drones operated by militants in Syria a few days after they had gone on free sale in various countries," he said. Novikov noted that Russia had created multi-layered defenses at its Hmeymim and Tartus bases in Syria to detect and destroy the entire range of terrorists’ weapons by firepower and electronic warfare measures. "It is necessary to note that the Defense Ministry of Russia is constantly monitoring the use of all types of armaments and military hardware by terrorists on the territory of Syria and is developing the required counter-measures," the general said. "This fully applies to unmanned aerial vehicles. For the purpose of countering their use by terrorists, in-depth systems have been created at the Hmeymim airbase and the Tartus naval facility with the detection, firepower and electronic warfare destruction and suppression capabilities," he said. These measures helped reliably thwart a terrorists’ drone attack on the Russian military facilities in Syria overnight to January 6, he said. There is real threat that terrorists may use drones in any place in the world and measures should be taken to neutralize it, according to Novikov. The analysis of drones captured in Syria draws conclusions that "there is a real threat of using drones for terrorist aims in any place in the world that demands certain measures on its neutralization," he said. Combating the threat of terror attacks involving unmanned aerial vehicles (UAVs) requires all the interested parties to cooperate on the international level, Russian Defense Ministry Spokesman Major General Igor Konashenkov said following the General Staff’s briefing on Thursday. "All the interested parties need to pay attention to such threats and cooperate on the international level to combat them," he said. 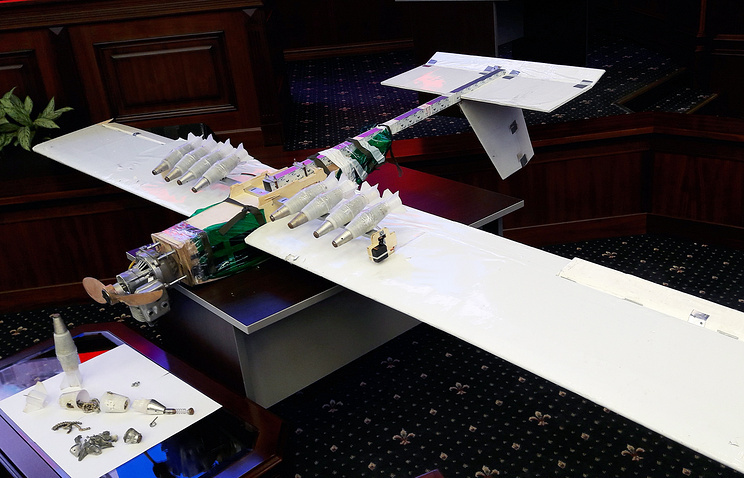 At the same time, Konashenkov pointed out that "the fact that militants received technologies to assemble and program combat unmanned aerial vehicles from abroad proves that the threat is not limited to Syria." "Terrorists may use similar deadly drones in other countries, too, and not only against military facilities," he added. The Russian Defense Ministry earlier reported that on January 6 militants in Syria massively used UAVs for the first time when attacking Russia’s Hmeymim airbase and the fleet supply base in Tartus. The attack was successfully repelled. Seven vehicles were shot down, and six were taken under control with the help of electronic warfare devices. Russian President Vladimir Putin on December 6, 2017 declared the complete defeat of the Islamic State on both banks of the Euphrates in Syria and on December 11 he issued orders to start the pullout of Russian forces from Syria. On December 22 Defense Minister Sergey Shoigu said the pullout of Russian forces from Syria had been completed. Three military police battalions, the reconciliation center and the bases at Hmeymim and Tartus remain.